Japanese IT giant Fujitsu has released a document listing motherboard and processor compatibility. However, it seems to have jumped the gun somewhat as the PDF, marked as information for OEM Sales March 2019, reveals a multitude of unannounced Intel Coffee Lake Refresh 9th gen Core processors. In January, at CES 2019, Intel launched six 9th gen desktop CPUs, with five 'F' suffixed SKUs (sans-iGPU). Now Fujitsu has fleshed out the range with many more entrants, and nicely includes the respective processor TDP ratings, max memory speeds supported, and iGPU designation (where included). 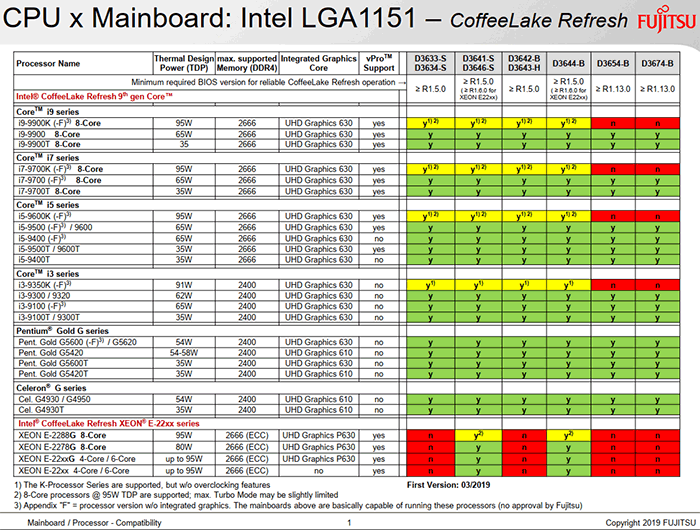 Pondering over Fujitsu's Coffee Lake Refresh list (page 2 of the PDF, screenshot above) at the top you will see the previously launched Core i9-9900KF, but moving down the list you will see the as-yet-unannounced i9-9900T. We saw a purported engineering sample of this chip surface in late January, and with this documentation release it looks to be a genuine leak. Fujitsu confirms this is an octa-core processor with a 35W TDP. It has the same 2666MHz DDR4 memory support as its i9-9900 prefixed siblings and comes with Intel UHD Graphics 630. Elsewhere in the Fujitsu document you might be surprised to see how many new 'F' suffixed and 'T' suffixed parts are on the way. It seems like most CPU models will come in 'F' and 'T' variants. For the 'F' variants, it is easy to understand that Intel is making the most of processors that have come out of the factory with defective iGPUs. There's even a 2-core/4-thread Pentium G5600F for entry level gaming rigs which will include a discrete graphics card. We see 'T' suffixed processors all the way from Core i9, i7, i5, i3, Pentium, to the Celeron series. Whichever model you choose from dual-core to octa-core, Intel has tweaked its 'T' processors to run at 35W. Lastly, there will be at least a quartet of Coffee Lake Refresh Xeon processors on the way. Thanks to FanlessTech for spotting the Fujitsu document. In other Intel CPU news today (in addition to coverage of the SPOILER flaws), Intel has discontinued production of 19 Skylake processors. This was revealed by an official Intel PCN notice (PDF) which marked the following processors for End of Life (EOL). Someone is going to be in trouble :whip: I'm excited to see what the new chips will offer though and how it will affect the pricing of the current gen which is a bit on the steep side. I'm surprised that Intel is bothering with this. These new processors don't seem to offer enough improvement over their 8th generation relatives to justify the effort and expense of introducing them. I hope this isn't an indication of further delays for Ice Lake, which is the product that Intel really needs to release. I'm still waiting for 10th gen.